Does your coffee cause dehydration symptoms? If you are at least 18 years old and can’t start your day without your morning coffee, you belong to the 62% of people in the United States who drink coffee every day. This is according to a 2017 report by the National Coffee Association (NCA). For many, coffee isn’t the only source of caffeine in their diet either. Other major sources of caffeine include tea, chocolate, energy drinks, and soft drinks. You probably drink coffee to keep you alert and awake, to boost your productivity, or simply because you love its taste and aroma. The caffeine that is found in your coffee is the reason why you feel a surge of energy and alertness at least 15 minutes after drinking coffee that lasts up to 6 hours. So how does this happen? According to the Food and Drug Administration (FDA), the commercial serving of an espresso coffee contains 64 mg of caffeine in a 30 ml cup while automatic drip coffees contain 145 mg of caffeine per 237 ml (8 ounces) cup. On the other hand, the caffeine content of brewed coffee ranges from 75 to 165 mg while your brewed decaf (decaffeinated) coffee still has an average of 2 mg of caffeine. Caffeine is a psychoactive stimulant, which means that it activates your central nervous system (CNS) thereby affecting your behavior, thinking, and mood. It also has a mild diuretic effect (increase in urine production) because it prevents the reabsorption of water and sodium in your kidneys by blocking the effect of your anti-diuretic hormone (ADH). Caffeine also blocks certain receptors in your aorta and coronary arteries (the blood vessels in charge of blood supply to your heart) that are responsible for regulating your heart rate and the diameter of your blood vessels (through vasodilation) depending on your needs. Since caffeine blocks these receptors, your body compensates by increasing the effects of your sympathetic nervous system. For this reason, you can experience an increase in blood pressure and heart rate (others report this as palpitation), when drinking caffeinated beverages. The effects of coffee on your body depend on the amount of caffeine you consume. The effects also vary with every person. On the other hand, ingesting 200-500 mg of caffeine an hour before participating in any physical activity or exercise has been shown to improve physical performance. Your body is mainly composed of water, which is typically measured in percent. A term infant has 75% total body water content. As you grow older your body’s water content decreases. An adult male is 60% water while an adult female is 50%. The body loses water through sweating, urination, defecation, and breathing (evaporation). Dehydration happens when your water loss is greater than your water intake. When you engage in a strenuous physical activity, you sweat. If you do the activity under the heat of the sun, you sweat even more. If you don’t replace the water you lost, you might get dehydrated. There are also drugs that cause dehydration such as laxatives, diuretics, and certain medicines for lowering blood pressure. Younger and older people are more prone to dehydration. The reason is that children, especially infants, apart from their inability to attend independently to their thirst, have a larger body surface area and a greater chance of suffering from fluid loss secondary to water evaporation. Children also have a faster metabolic rate. Older people, on the other hand, have poor thirst sensation and memory problems. Generally, they also have mobility problems, making it difficult for them to get water. In elderly adults, thirst is not a reliable sign of dehydration. They usually present with dizziness, confusion, and a noticeable drop in their blood pressure readings. In children, additional signs of dehydration include poor skin turgor, crying without tears, and (for infants) sunken fontanels. Some studies have shown that caffeine does not cause dehydration when it is consumed in low-to-moderate doses. Although caffeine has an acute diuretic effect, people tend to develop tolerance over this physiologic effect so they don’t experience frequent urination the longer they ingest caffeine. Likewise, the diuresis isn’t enough to cause dehydration and fluid imbalance. However, other studies have shown that moderate to high doses of caffeine can contribute to dehydration in some people. As stated earlier, the effects of coffee on your body depend on the amount of caffeine you consume, and these effects will vary with every person. The only way to know for sure if coffee is affecting your body hydration is to watch for the signs and symptoms of dehydration. 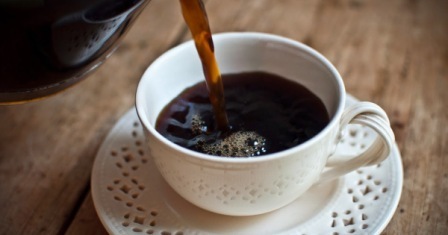 If you have any symptoms, you could experiment with drinking less coffee. Or if you really don’t want to drink less coffee, you could simply drink more water to re-hydrate your body. NCBI.nlm.gov; Caffeine Effects on the Cardiovascular System; 2014. ScienceDirect.com; A Review of Caffeine's Effects on Cognitive, Physical and Occupational Performance; 2016. Guest contributor Jessica Hegg is the content manager at ViveHealth.com. Avid gym-rat and nutrition enthusiast, she’s interested in all things related to staying active and living a healthy lifestyle.